Kayvan Sabeghi is the second former U.S. Army veteran arrived in intensive care after he was beaten by police during clashes with Occupy Oakland protesters on Friday, the veteran’s group said. Kayvan Sabeghi, 32, was arrested and hospitalized one week after another U.S. military veteran and Occupy Oakland protester, former Marine Scott Olsen, was badly injured in a confrontation with police that helped spark the latest round of unrest. Iraq Veterans Against the War said Kayvan Sabeghi was detained during disturbances that erupted late on Wednesday in downtown Oakland and was charged with resisting arrest and remaining present at the place of a riot. 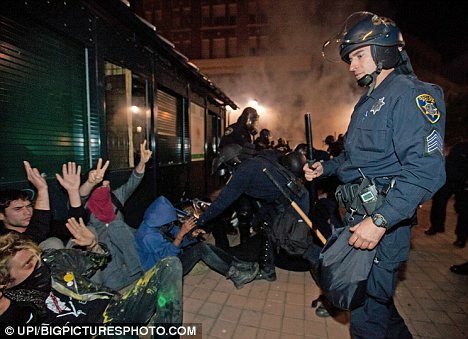 Oakland Police had arrested more than 100 demonstrators in clashes with protesters late on Wednesday and early on Thursday following a day of mostly peaceful rallies against economic inequality, corporate excesses and bailouts of major banks. It was reported that several bank branches were closed and the Port of Oakland was shut down for several hours by the demonstrations. Brian Kelly, who co-owns a brew pub with Kayvan Sabeghi, said his business partner told him he was arrested and beaten by a group of policemen as he was leaving the protest to go home. “He told me he was in the hospital with a lacerated spleen and that the cops had jumped him. “They put him in jail, and he told them he was injured, and they denied him medical treatment for about 18 hours,” Brian Kelly said. Kayvan Sabeghi had served as an Army Ranger in Iraq and Afghanistan. Oakland Police Department did not immediately return calls seeking comment. Iraq Veterans Against the War said in a statement that police struck Kayvan Sabeghi with nightsticks on his hands, shoulders, ribs and back, and that in addition to a lacerated spleen he suffered from internal bleeding. Kayvan Sabeghi’s name was listed by the Alameda County Sheriff’s Office as among those arrested that night, and Highland General Hospital confirmed he was a patient in its intensive care unit. According to Oakland officials, eight people, five civilians and three police officers, were injured in the late-night confrontations. But it was not immediately clear whether Kayvan Sabeghi was among those counted as hurt. Police had remained largely out of sight during Wednesday’s protests until busloads of officers in riot gear moved in on demonstrators at about midnight, firing volleys of tear gas to disperse hundreds lingering near a downtown plaza used as a base camp for Occupy Oakland protesters. Police also made a second charge with batons and tear gas about an hour later to drive protesters deeper into the square. Oakland officials said police had acted in response to small pockets of “anarchists” who vandalized property, set fires, assaulted police officers and broke into a downtown building. But Occupy Oakland protesters said that the streets were largely calm when police converged, although sporadic vandalism and unruliness had been reported during the day. The call for a citywide strike that preceded the confrontations was triggered in part by outrage over Scott Olsen’s injuries during a separate confrontation with police last Tuesday that became a rallying cry for the anti-Wall Street protest movement nationwide.